The joint SEPAC stamp motif is local or typical handcraft. 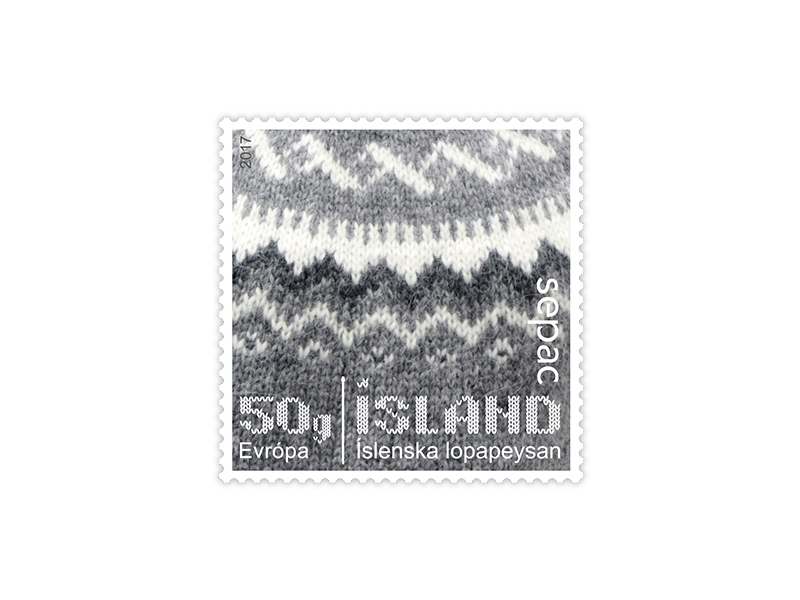 The Icelandic stamp features an Icelandic sweater. The pattern shown, ”Álafoss pattern no. 51”, is a very characteristic one, designed by Mrs. Astrid Ellingsen. It was probably affected by foreign knitting traditions introduced by magazines on embroidery and fashion. The Greenland national dress and Norwegian knitting patterns may also have influenced the pattern. When Icelandic women began to adopt foreign knitting patterns and work on them according to the properties of the local material, Icelandic sweaters started resembling their foreign models, but its patterns and colors were coarser. This was due to the yarn being more fragile than the spun band. Sweaters were therefore usually knitted from three threads simultaneously. This made the garment warmer and more durable. The sweater became standardized in its traditional form in the late sixties. In the seventies, it became a popular export. It became less popular in the eighties, but now it seems to have regained its former popularity, especially among foreign tourists. The sweater has its special woolen character and its roots in the culture of contemporary Icelanders are quite solid.